The draft law on amnesty proposed by VMRO-DPMNE was not passed in the Parliament. Nevenka Stamenkovska from VMRO-DPMNE says that the accused are not terrorists. 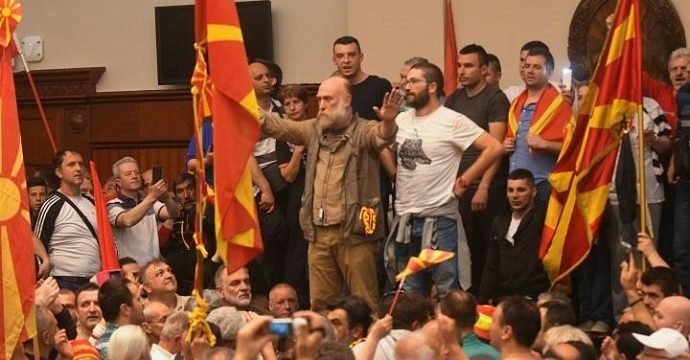 Kostadin Kostadinov from SDSM is clear: no one among those who ordered, planned and committed the violence on April 27th should be amnestied. After VMRO-DPMNE’s draft law on full amnesty for the participants on April 27th was not passed in the Parliament, the opposition party accuses the government of selective justice. “Igor Durlovski, Bogdan Ilievski, Boris Damovski, Vlado Jovanovski are not terrorists. You know this as well as the whole Macedonian public. If you want national reconciliation and non-selective enforcement of justice, this law should be supported.” This was stated by Nevenka Stamenkovska from VMRO-DPMNE at the parliamentary pulpit explaining the draft law on amnesty for the events on April 27th. SDSM spokesman Kostadin Kostadinov rejected the accusations and said that VMRO-DPMNE should distinguish between those who ordered or those who committed violence and those who were in euphoria during the violence in the Parliament. “Those who planned, ordered and committed violence on April 27th cannot be amnestied”, Kostadinov said. These past days, Prime Minister Zoran Zaev said that there will be amnesty only for those who were not directly involved in the “bloody Thursday” events. The Minister of Justice, Renata Deskoska Trenevska, also said that VMRO-DPMNE is demanding the release of all suspects, accused and convicted. “Since the amnesty that was covered in this draft law was broader, the position was that an eventual amnesty should be resolved within the framework of the reconciliation body”, said Minister Deskoska. “I do not agree that this is a matter of selective justice exclusively in terms of having a different approach according to the gravity of the case. If someone is charged with terrorism, such an act is different from attack in a crowd, from abuse of office, and so on, and if so, then we always have selectivity. Therefore, there is a different approach in different cases and I do not accept the fact that this is selectivity. The draft law on amnesty of VMRO-DPMNE, according to their statement, says that all those who took part in the events on April 27th should be amnestied. With this, I have a problem and I do not agree”, says Tsatsa Nikolovska. She also points out that we need to be careful with the offer for reconciliation which, as she stressed, must in no way be detrimental to the rule of law and the independence of the judiciary. “I do not know what this reconciliation will be, in fact I understood it as future behaviour among the MPs, but the rule of law and the independence of the judiciary must absolutely be taken into account. 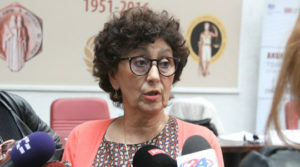 We have a separation of powers and nobody should put into question the principle of the rule of law, the equality in the responsibility for the same crimes and the independence and impartiality of the third power, the judiciary, which unfortunately has been criticized for a long time in Macedonia”, emphasizes Tsatsa Nikolovska. In Macedonia amnesty has been granted on several occasions after political parties had previously made political cases. It was a large-scale amnesty for the 2001 conflict that was presented to the public as a reconciliation of ethnic communities, and hence the amnesty of the Hague cases.